Iran's northern geopolitical interests are complex but can be defined in terms of their geographical dimensions. Three regions of direct interest to Iran are the Caucasus, the Caspian Sea, and Central Asia. The Caucasus is a region of mixed Moslem and Christian nations with limited economic resources. Establishing strong ties with Georgia, Armenia, Azerbaijan, and others in this region is highly significant for Iran. The Caucasus does not, however, have top priority in Iran's geopolitical interests, except when provoked by its traditional rivalries with Turkey and Russia. Also, the dual nature (from the Iranian point of view) of Azerbaijan's geographical position in this region commands Iran's special attention, because (a) the Republic of Azerbaijan is the geographical continuation of Iran's Azerbaijan provinces, which represents a major geostrategic sensitivity for Iran; and (b) the Republic of Azerbaijan is a major oil-exporting country of the Caspian Sea region with good prospects for assisting Iran in its oil activities in this region. Iran is one of five states that border on the Caspian Sea and, therefore, has substantial interests in that region. The four other Caspian coastal states are Kazakhstan, Azerbaijan, Russia, and Turkmenistan (fig. 9.1). The Caspian Sea is highly significant for Iran from an economic point of view. An economic cooperation arrangement among the riparian nations could prove to be very beneficial to them all. It could also assure a significant position for such a regional arrangement in the world's changing international power structures. With gas reserves of 57.1 trillion km3, this region ranks first in the world, and, with 59.2 billion barrels of oil reserves, it ranks as the world's third most important oil region. At least four regional economic and environmental problems require attention. Water pollution caused by the excessive concentration of oil products and phenols in the northern (Russian) and eastern (Turkmenistan) coastal areas of the Caspian exceeds the maximum allowable level by four to six times; along its western coast (Azerbaijan) this pollution level is 12 to 16 times higher than allowable (Soviet Business Intelligence Bureau, 1993, p. 47). The rapid rise in the level of the Caspian Sea over the past two decades has caused considerable damage to the coastal areas of all five riparian states. In Mazandaran Province, one of three Iranian provinces bordering the Sea, 9.9 billion Iranian rials (US$1 = Rls70) has been spent constructing 8.5 km of barriers along the coasts of B�ndar Turkmen, Nowshahr, Ramsar, and Tonekabon. An additional 27 km still need to be constructed in the same province (Ettelaat International, 20 September 1995, quoting reports from the Governorate General of Mazandaran). A 1947 Iranian study (Barimani, 1947, pp. 78-90) suggests that the rise in the level of the Caspian Sea is a periodic phenomenon recurring a few times a century (about every 30-35 years), usually after a few consecutive wet winters. This study provides evidence from early Islamic geographers (such as Masudi), which, although anecdotal, noted great historical variations in the water level of the Caspian Sea. Because of these and more recent observations (see chap. 8 in this volume), there has been considerable research interest among the riparian states in the causes and the ecological and societal impacts of the rise in the level of the Caspian Sea. In the past the Caspian Sea was bordered by only two riparian states: Iran and the Soviet Union. Several agreements between the two states governed the Sea's maritime legal regime. As a result of the breakup of the former Soviet Union, five independent countries now border the Sea. 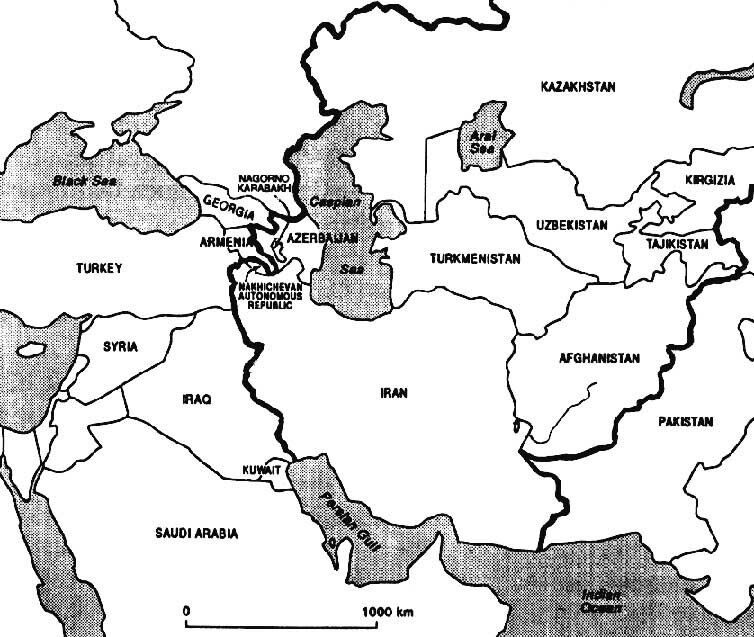 In 1992 the Iranians embarked on the creation of the Council of Caspian Sea Countries (CCSC). This council is to include the five states bordering the Sea. Iran has been slow to define its role in the region. It could, however, be able to function as a forum to discuss matters related to the common interests of the riparian states formulating the means and methods such as for defining the legal regime of the Sea. This slow progress can, in part, be attributed to the way in which some riparian states and Western oil companies rushed in to gain concessions, sometimes in disputed offshore areas that were claimed by more than one coastal authority. An intergovernmental conference, held in the Russian city of Astrakhan on 15 October 1993, with the participation of Russia, Azerbaijan, Turkmenistan, and Kazakhstan, discussed the Russian desire to establish a common position within the CIS that could then be presented to Iran. The Russians argued that the 1921 treaty signed between the former Soviet Union and Iran forms the basis on which the Caspian legal regime can evolve (NEFTE Compass, 24 November 1993). This treaty provides for both Iran and the former Soviet Union to have equal rights of free navigation on the Sea. This regime would allow the Sea to be an object of common use by riparian states on an equal basis. However, implementation of this regime would, no doubt, cause considerable economic "damage" to the oil companies that have invested in exploration in the concession areas granted by the Republic of Azerbaijan. The Republic of Azerbaijan prefers a 10-, 20-, or 40-mile exclusive economic zone offshore of each state (Khodadov, 1995). Western interests favour this argument against the Russian position. The United States supports the Republic of Azerbaijan and the US-led Azeri oil consortium, arguing that delimitation of the Sea is the most logical, equitable, and workable resolution of national rights to the Sea's resources (Race, 1995). Unhappy about the expansion of oil exploration by Azerbaijan and Western companies, Iran and Turkmenistan are gradually moving toward the Russian position (Daily Salam of Tehran, 3 July 1995, reporting statements by Iran's Minister of Foreign Affairs in Switzerland). These three states appear to be formulating a common policy vis-�-vis the issue of the Caspian Sea's legal regime. In 1995, leading officials of Russia, Iran, and Turkmenistan warned that use of Caspian Sea resources should be considered illegal until such a legal regime had been formulated (Ettelaat International, 11 August 1995, quoting Turkmenistan's Minister of Foreign Affairs). The Russians went so far as to declare that exploration of Caspian Sea resources before such a legal regime had been formulated should be considered illegal (Echo of Iran, Aug./Sep. 1995, p. 7, reporting statements by the Russian Deputy Minister of Foreign Affairs in Turkey). The Iranians also warned that the unilateral exploitation of the Caspian Sea before the establishment of a legal system could jeopardize cooperation in the Caspian Sea region (Ettelaat International, 10 August 1995, reporting statements by the Iranian Minister of Foreign Affairs in Almaty). These legal uncertainties have resulted in noticeable complications in the development of the maritime activities of each state. For instance, the Republic of Azerbaijan has granted various companies oil exploration concessions that extend far to the east into areas considered by the Republic of Turkmenistan to be within its maritime jurisdiction. The riparian states remain engaged in consultations concerning the future legal regime of the Caspian Sea. The issue of exporting oil from the Caspian Sea region to the outside world has attracted great attention. Iran's geographical position between the Caspian Sea and the Persian Gulf provides an outstanding opportunity for oil and gas pipelines to run from the Caspian Sea to the Persian Gulf and the Gulf of Oman. Not only does this geographical location offer the shortest route for oil and gas from the Caspian Sea region to markets in Japan and the Far East, but Iran's 90 years of experience in the oil and gas industries and its existing oil and gas installations, port facilities, refineries, and networks of oil and gas pipelines offer considerable advantages to Caspian oil and gas exporters. Iran's existing gas pipeline networks are already connected to the Republic of Azerbaijan and they are within a short distance of the Republic of Turkmenistan. A pipeline connecting Kazakhstan and Turkmenistan to this network would be at least four times shorter in length and much cheaper than any of the proposed lines to other outlets such as the Black Sea and the Mediterranean. The alternative networks would, moreover, have to pass through mountainous areas where various ethnic groups are involved in political struggles against one another as well as against national governments in the region. This would reduce the security of the trans-Caucasus line to a minimum. Iran signed an agreement with Turkmenistan on 30 January 1995, whereby Turkmen oil would at first be transported to Iran overland and later would be piped to the nearby Iranian refineries. It would then be exported to distant world markets through Iran's Persian Gulf ports (Ettelaat International, 1 February 1995). In fact, the first consignment of 3,200 tons of Turkmen oil was reported to have been shipped on 1 February 1995 to the northern Iranian port of Bandar Noshahr for onward transit for export (Ettelaut International, 23 February 1995). Other companies operating in Central Asia are also reported to be trying to transport crude through Iran to the Persian Gulf. In a different development, the Republic of Azerbaijan offered to allocate 5 per cent of its share in the Azerbaijan International Oil Consortium (NIOC) to Iran, allowing Iran to participate in the oil activities of Azerbaijan in the Caspian Sea and to facilitate construction of an oil pipeline across Iranian territory to provide access to a Turkish port on the Mediterranean. An official request was made of Iran in that respect after a contract was signed between the Azeri Oil Company and the National Iranian Oil Company (NIOC) on 3 February 1995 (Ettelaat International, 6 February 1995). The Azerbaijan Republic's offer to allot to Iran 5 per cent of its share in the NIOC was withdrawn in April 1995 as a result of US pressure. Nevertheless, the republic continued to encourage Iran to participate in other areas of oil activities within the country. Several factors dictate cooperation between Azerbaijan and Iran. For example, apart from ethnic, historical, and religious affinities between the two countries, much of the south-eastern parts of Azerbaijan's offshore oil fields are shared with Iran. This provides Iran with the possibility of exploiting the fields without additional outside participation. In any case, US pressure on Azerbaijan goes against its tradition of cross-border collaboration with Iran. Having benefited for several decades from the hydropolitics of cooperation over the border river Aras, Iran and the Republic of Azerbaijan have developed a considerable capacity for cooperation in various fields. It must have been on this basis that in May 1995 Azerbaijan declared that it was still possible for the crude oil produced by NIOC to be partly exported via Iran to the Persian Gulf. Iran has suggested the construction of a pipeline network that would connect Caspian-Central Asian oil exporters with the Persian Gulf. One of the projects proposed by Iranian Foreign Ministry officials consists of a gas loop system involving Iran that has the potential of connecting 70 per cent of the world gas reserves of Russia and Iran in the Persian Gulf, supplying both Europe and Asia with adequate gas supplies in the twenty-first century. An important advantage of this proposed network over other projects is that nearly half of this loop is already in existence and operational (Ghorban, 1994, p. 297). This ambitious system would connect the Caspian-Central Asia region with Europe on the one hand, and with India and the Far East on the other. The Iranian Oil Ministry has presented Turkmenistan with elaborate technical studies (including route maps) for Turkmenistan's proposed US$3 billion, 1,400 km pipeline in order to deliver 15-30 billion m3 of natural gas annually to Europe by way of Iran and Turkey (NEFTE Compass, 28 July 1994). The Iranians have discussed with Turkmen representatives the possibility of developing a 120,000 barrels/day crude oil pipeline to Iranian refineries (NEFTE Compass, 14 July 1994). Yet another project for the Turkmen-Iranian oil pipeline to deliver 400,000 barrels/day to the Persian Gulf is planned to be completed in 2002 (NEFTE Compass, 10 February 1994). Iran's hopes with regard to the geopolitics of oil pipelines are being hampered by the enforcement of a rigid US policy of containment against Iran's expanded involvement in the region. This American stance does not seem to be based on the merit of economic developments in the region; rather, it is voiced in general terms: "any idea of an Iranian involvement in the affairs of Caspian-Central Asia - her own region - is not desirable to the United States" (Race, 1995). Having sifted through dozens of pipeline prospects for over a year, the NIOC, which is predominantly owned by US companies, decided in September 1995 to choose the Russian pipeline option through either Chechnya or Georgia, following the rejection of the most viable route - through Iran (The Times, London, as quoted in Ettelaut International, 11 September 1995). This choice was based solely on US political considerations. Nevertheless, Iran's short-cut route for exports of Caspian Sea oil makes Azerbaijan stand by its view that it is still possible for the crude oil produced by the NIOC to be exported partly via the Persian Gulf in an Iranian-Azeri oil-swap deal (Ettelaat International, 17 March 1995). A similar suggestion was made by Kazakhstan for part of its Tengiz oil field production to be exported through the Persian Gulf in a swap deal with Iran (Ettelaat International, 11 October 1995). In addition, Iran not only started oil exploration in its own Caspian offshore areas in 1995, but also created two exploration companies with Russia and Azerbaijan (Ettelaat International, 28 September 1995). The NIOC also signed an agreement with Azerbaijan, whereby the two states agreed to drill for oil in Iran's offshore area (Ettelaat International, 7 August 1995). Of the Caspian and Central Asian republics, Uzbekistan was the only state that subscribed to the US declaration of economic sanctions against Iran. Although some Uzbek officials contradicted others by denying reports that the republic endorsed US sanctions against Iran, the Uzbek republic continued to contravene Iranian policies in Central Asia. Iran's third northern geopolitical region of concern includes the five newly independent states of Turkmenistan, Kazakhstan, Uzbekistan, Tajikistan, and Kyrgyzstan. This region is connected to the Caspian Sea region because two of the Central Asian nations, Turkmenistan and Kazakhstan, along with Iran itself, border the Caspian Sea. The Republic of Azerbaijan is the only Muslim state of the Caucasus, which separates it culturally from the other states. Yet this factor, together with Azerbaijan's economic and strategic homogeneity with the Caspian Sea and Central Asian states, links Azerbaijan to the nations of both regions. Inclusion of the Republic of Azerbaijan in the Economic Cooperation Organization (ECO) alongside the Central Asian republics confirms a geopolitical perspective that places Azerbaijan within the broader Caspian-Central Asia region. ECO membership comprises Azerbaijan, Kazakhstan, Turkmenistan, Uzbekistan, Tajikistan, Kyrgyzstan, and Afghanistan, as well as Iran, Turkey, and Pakistan; the latter three countries are the original members of the ECO's predecessor, the Regional Cooperation Organization (RCD). The ECO was formed in February 1992, and has held annual summit meetings. The leaders of the Islamic Republic of Iran have openly expressed the hope that the ECO would become a regional economic grouping worthy of global competition in the twenty-first century (Rafsanjani, 1995). However, the success of this regional formation is open to doubt, not just because six of the Caspian-Central Asian republics are also members of the CIS, but also because there is not yet the necessary cohesion amongst member states for the level of economic integration required for a serious regional organization. Furthermore, Turkey, an important member of the ECO, does not appear to harbour as much dedication to making this regional organization successful as it does to joining the European Union. Similarly, the bulk of Pakistan's geopolitical attention has centred on the Indian subcontinent, which prevents it from committing fully to the ECO as an economically and politically integrated regional organization. These are the same factors that caused the RCD to fail, after functioning for three decades as an effective regional organization. Thus, Iran has no alternative but to pursue its own geopolitical perspective of a regional organization in Central Asia. A number of factors make the Caspian-Central Asia area worthy of the geographical term "region." HTSTORICALLY. The peoples of Iran, Afghanistan, Tajikistan, Turkmenistan, Uzbekistan, and parts of Kazakhstan, together with most peoples of the Caucasus, have long experience of living together in the commonwealth of the pre-Islamic Achaemenian, Parthian, and Sassanid empires, in the Abbasid caliphate, in the Persian and Turkic empires of the Samanids, Seljhuqids, and Ghaznavids, and, more recently, in the Safavid empire. CULTURALLY. The experience of more than 2,000 years of interaction among the nations of the Caspian-Central Asia region within a politically united commonwealth has created a cultural conglomeration that binds these nations together in their geographic region. The expansion of Islam eastward added a new impetus to this cultural conglomeration, further strengthening it. Iran shares a common language with Tajikistan and the majority of the people of Afghanistan and Uzbekistan, and Azerbaijan is now the only other Shiite country in the world besides Iran. Central Asian cities such as Bokhara, Samarkand, Balkh, Merv, Khiva, and Khorezm feature prominently in Persian literature as traditional centres of Iranian arts and science. Finally, millions of fellow Turkmen and Azeris - unscathed by the Russian colonial drive of the nineteenth century - live in the Azerbaijan and Turkmensahra provinces of Iran. GEOGRAPHICALLY. It is worth observing that all the Muslim republics of the former Soviet Union are landlocked, with little prospect of easy access to the world's oceans. This problem will become more pronounced as the economic independence of those republics gradually becomes full-blown and if the CIS with Slavic and Muslim states fails to be effective. Kazakhstan, Turkmenistan, and Azerbaijan, along with Iran and Russia, have access to the Caspian Sea, which could encourage maritime trade among these states. Such a development would not, however, solve the problem of lack of access (via the sea) to the markets of the world. A practical solution to this geographical fact would be the linking of these republics and Afghanistan to the Persian Gulf and the Gulf of Oman by road, railway, and networks of oil and gas pipelines. With its 2,000 miles of coastline on the Persian Gulf, the Strait of Hormuz, and the Gulf of Oman, Iran is the only Central Asian country with free access to the open seas. This could be of great benefit to the landlocked countries of the region as well. Moreover, Iran's vast natural resources, matched by no other neighbouring country, provide a situation that encourages economic and technological cooperation among the states of the region. In early December 1991 an agreement was signed between Iran and Kazakhstan allowing all Central Asian republics to extend their railway networks to the Persian Gulf via Iran (Echo of Iran, December 1991, p. 6). Another agreement signed in the same year with the former Soviet Union, and upheld by the new republics, lifted border obstacles between Azerbaijan and Turkmenistan with Iran. This agreement enabled cross-border peoples of the same ethnic background to travel freely within 45 miles on each side of their borders. Tripartite cooperation between Iran, Turkmenistan, and Armenia increased dramatically in 1995 and an agreement was signed by these states in June 1995 to expand trade by road transport among the three (Ettelaat International, 6 June 1995). In the presence of the leaders of all Central Asian republics in March 1995 (Ettelaat International, 17 March 1995), inauguration of the internal Iranian railway network to the Iranian port of Bandar Abbas on the Persian Gulf - to be linked to the Central Asian railway networks in early 1996 - was a testimonial to Iran's efforts to assume the role described by Kazakh leaders as "the main bridge between Central Asia and the outside world via the Persian Gulf" (Ettelaat International, 20 June 1995). To enhance this role, Iran is also seeking to attract India to participate in the expansion of its railway networks. Currently Indian ships use Georgian, Russian, and Ukranian ports in the Crimean Peninsula, and hundreds of kilometres of road through Russia in order to reach Central Asia. Iran has reportedly approached India to fund a 700 km rail stretch between Bafq and Mashhad (Ettelaat International, 28 March 1995). Once this stretch is completed, the Persian Gulf-Central Asian connection will have been shortened by several hundred kilometres. This would give India a lead over its neighbours in Central Asia and would tremendously benefit the expansion of its economic (especially trade) links with Central Asia. ECONOMICALLY. In spite of the progress being made in increasing road and railway links with Central Asia, Iran does not seem to have made much progress in mobilizing the region toward the formation of a regional economic grouping, other than the ECO. In fact, until the end of 1994, it seemed that Iran had lost the battle with Russia for the hearts and minds of the former Soviet republics. This loss resulted from the combined effect of political and economic shortcomings, which prevented Iran from making the kind of commitment that these republics needed to enhance their political and economic independence. Added to this is a determined US-Israeli policy of blocking the expansion of Iranian influence in the region (Ettelaat International, 1 November 1995). Competition from Russia and rivalries with Turkey, Pakistan, and Saudi Arabia have made it difficult for Iran to achieve its northern geopolitical aspirations. To overcome a situation of near-impasse, Iran on the one hand seems to have formulated new strategies based on views closer to those of Russia and, on the other, has expanded bilateral and trilateral relations with the Central Asian republics. The emergence in 1995 of a coordinated Russo-Iranian political front in the Caspian-Central Asia region facilitated the expansive roles of both countries there. Apart from the repeated Russian confirmation of continued nuclear and technological cooperation with Iran (to the displeasure of the United States), the two countries agreed in October 1995 to set up a joint company for oil projects in which other countries could also participate (Ettelaat International, 1 November 1995). Together, Iran, Russia, and Central Asia have 54 per cent of the world's natural gas deposits. Exploitation of these resources and their export through an elaborate pipeline network would, from the Iranian point of view, enhance its northern geopolitical strategy and, therefore, its key position in the emerging global political hierarchy. An agreement signed in September 1994 between Iran and Turkmenistan will realize the construction of a gas pipeline from Central Asia to Europe via Iran to be completed in 25 years; Iran will cover 50 per cent of the costs. This line is scheduled to be completed in two phases, initially carrying an annual 10-12 billion m3 of gas, which will then be increased to 28-30 billion m3 in the second phase (Daily Ettelaat, 22 September 1994). Another agreement signed in Tehran in July 1995 provides for a second line connecting Turkmenistan to existing Iranian gas lines. A 200 km pipeline will be constructed, 60 km of which will be on Iranian territory (Ettelaat International, 7 July 1995). Iran also signed an agreement with India in August 1995, whereby India will be connected to the Iranian and Central Asian gas fields through a 2,000 km pipeline (Ettelaat International, 4 August 1995). This network will undoubtedly play a major future role in linking the Caspian-Central Asia region to gas and oil consumers on the Indian subcontinent and in the Far East. Pakistan has been pressing hard for a share in this future by trying to become connected to Iranian and Central Asian gas fields. Having secured understandings with Iran in this regard, Pakistan reached agreement with Turkmenistan in October 1995 whereby a gas pipeline would connect Pakistan to Central Asia via Afghanistan (Ettelaat International, 12 October 1995). This will prove to be a major link in the emerging multinational gas pipeline networks originating from Iran and Central Asia. However, Afghanistan's lack of security will prove to be a major obstacle to the implementation of a trans-Afghanistan pipeline project. On the political front, sharing political views about the Caspian Central Asia region with Russia enabled Iran to bring about a preliminary cease-fire agreement in Tehran, on 19 July 1995, between the pro-Russia government leaders of Tajikistan and leaders of Tajikistan's Islamic opposition. In a separate development, Tajik leaders have urged for defence cooperation with Iran (Ettelaat International, 2 November 1995). Furthermore, Iran signed a Memorandum of Understanding with Turkmenistan and Tajikistan whereby economic, political, and cultural cooperation among the three would start within a new framework (Ettelaat International, 13 September 1995). It is hoped that this will serve as the foundation upon which viable Iran Central Asian regional integration will develop. The three states have emphasized that their regional cooperation could serve as a suitable model for sustainable economic development and could restore peace and stability in the region (Ettelaat International, 13 September 1995, quoting the leaders at the tripartite meeting in Ashkhabad). These shared historical, cultural, geographical, and economic factors are aspects of a relatively homogeneous environment that could constitute a geopolitical region. A common market in this region, with the geographical and economic advantages of each country complementing the others, is an ideal prospect that could take the whole region as an economic group into the twenty-first century. In the eastern part of Iran, on the southern edge of Central Asia, a major environmental disaster has been in progress during the past 90 years. Lake Hamun (Hamun is an ancient Persian word meaning "lake") was apparently a much larger lake in the past than it is now. It has gradually diminished and with it almost the whole of a water-related local economy has gone. Not only is Lake Hamun the only source of irrigation water in Sistan Province other than the Hirmand River, but it has played a pivotal role for the population in this corner of Central Asia. With an area of 8,117 km2 of very fertile soil and a population of over 274,000 (Census Taking Centre of Iran, 1986, p. 1), the district of Sistan is virtually dependent on Lake Hamun and its only perennial tributary, the Hirmand River (Hirmand is also an ancient Persian term meaning "abundant in water"). The Hirmand is the tenth-largest river in Asia and drains much of Afghanistan. The main delta branch of the Hirman forms international boundaries between Iran and Afghanistan. Having been described with great exaggeration at the turn of the twentieth century as a lake of 150,000 sq. miles (fate, 1909, p. 237), Lake Hamun has been reduced to four small pools of water today, with a total surface area of less than 1,200 km2. This slow-onset, low-grade, but cumulative environmental disaster is the result of a series of policies implemented in Afghanistan regarding the use of Hirmand River water. The problem began in 1872, when British General Goldsmid delimited the boundary line between Iran and Afghanistan along the main branch of the river. This situation was further aggravated in 1905 when British Colonel McMahon's water resource arbitration awarded two-thirds of the Hirmand delta water to Afghanistan and one-third to the more heavily cultivated, more densely populated Sistan in Iran. As friendly relations developed in the 1930s between the newly independent government of Afghanistan and the centralized government of Iran, the two countries signed an agreement (1939) that divided Hirmand delta water equally between the two (Iran-Afghanistan Treaty of Hirmand Water Division, 1939, Articles I and II). This agreement, however, was ignored by Afghanistan, and the dispute deepened as a number of American companies were given concessions in 1945 by the Afghans for the construction of diversion dams and canals, which further reduced the amount of water reaching the Iranian province of Sistan and Lake Hamun. The Hirmand River's average annual flow in the 1990s has been estimated at 2-3 billion m3 or 70-100 m3 per second. This figure was further reduced to a mere 45 m3 per second in 1994, of which only 15 m3 per second entered Sistan (Omur-e Ab-e Sistan, 1995, p. 6). The disastrous collapse of the Soviet occupation of Afghanistan resulted in a protracted civil war that continues today. The involvement of the Islamic Republic of Iran in Afghan politics is no longer motivated by hydropolitical considerations regarding the Hirmand River and Lake Hamun, but is to foster the emergence of a friendly Islamic regime in that country. The creeping environmental catastrophe taking place on the southern edge of Central Asia is almost an exact repeat of the Aral Sea catastrophe. Flooding in the Hirmand delta and the restoration of Lake Hamun in recent years do not represent a change of policy; they are the consequence of diminished politico-administrative and technical controls in Afghanistan. These improvements are likely to be only temporary until the completion of the construction of the Kamal Khan diversion dam, which will likely deepen the environmental catastrophe in Sistan and will exacerbate the rift between Iran and Afghanistan. In light of the changing global geopolitical structure following the demise of communism, Iran has assumed an extremely important role as the landmass that bridges two very important oil regions of the world - the Caspian Sea and the Persian Gulf. In its diplomatic overtures to the republics of the Caucasus, the Caspian region, and Central Asia, the Islamic Republic of Iran has been trying hard to emphasize economic rather than ideological and political motives. Genuinely concerned about the breakdown of security on its northern border, it has so far brokered at least two cease-fires in the conflict between Azerbaijan and Armenia over Nagorno-Karabakh, and two cease-fires in the Tajikistan civil war. Depending on (1) the socio-political flexibility of the existing political structure of Iran, (2) its conceptual capacity to give top priority to the geographical aspects of its national interests over ideological considerations in its foreign and regional policies, and (3) its ability to create a well-organized administrative system that would improve its image, Iran will be able to emerge as a significant regional political power as well as an economic success story. Moreover, Iran could decide to make major changes in its foreign and domestic policies. If so, Iran could become a major regional power with the ability to create a successful regional grouping. The formation of any regional grouping, however, will depend on Iran's skill in settling geographical differences with neighbours and its ability to strengthen ties to them. No doubt, an improved image for Iran would be the most effective instrument for changing the political attitude of the United States toward Iranian national interests in the Caspian - Central Asia and Persian Gulf regions. 1. Private notes sent to me by Mahmud Forughi, Iran's Ambassador in Afghanistan in the late 1960s and early 1970s, who negotiated the 1973 agreement. 2. Statements made to me on Saturday, 4 April 1992, by Dr. Alinaghi Alikhani, a former Minister of Economy and a high-level official of the government of Imperial Iran between 1965 and 1971. Barimani, A.1947. Dariay-e Khazar [The Caspian Sea]. Tehran: Entesharat-e Rangin. Census Taking Centre of Iran. 1986. General Census of 1986, vol. 142-3, Tehran. Ghorban, N. 1994. "Middle East Petroleum and Gas Conference in Bahrain (16 18 January 1994)." Iranian Journal of International Affairs VI (1 and 2). Iran-Afghanistan Treaty of Hirmand Water Division. 1939. Author's private collection (in Persian). Khodadov, A. 1995. Statements by the representative of the Russian Foreign Ministry to the seminar on the Caspian Sea held in London, 24 February. Mojtahed-Zadeh, P. 1992. The Changing World Order and the Geopolitical Regions of the Persian Gulf and Caspian-Central Asia. London: Urosevic Foundation Publications. Omur-e Ab-e Sistan. 1995. A report by the Governorate of Zabul, February/March. Courtesy of Mr. Mohtadi of the Centre for Middle East Scientific Research and Strategic Studies, Tehran. Race, G. 1995. Statement by the representative of the US State Department to the seminar on the Caspian Sea held in London, 24 February. Rafsanjani, A. A. 1995. "Address by President Rafsanjani of the Islamic Republic of Iran to the third summit meeting of ECO, Islamabad." Ettelaat International, 15 March 1995. Soviet Business Intelligence Bureau. 1993. Monthly Journal, East Consult/Moscow, special report on Central Asia, June. Tate, G. P. 1909. The Frontier of Baloochistan - Travel on the Border of Persia and Afghanistan. London: Witherby.